I am a shoe person. As in if I have spare money in my monthly shopping allowance, it most always goes to shoes (bills, what bills!?). 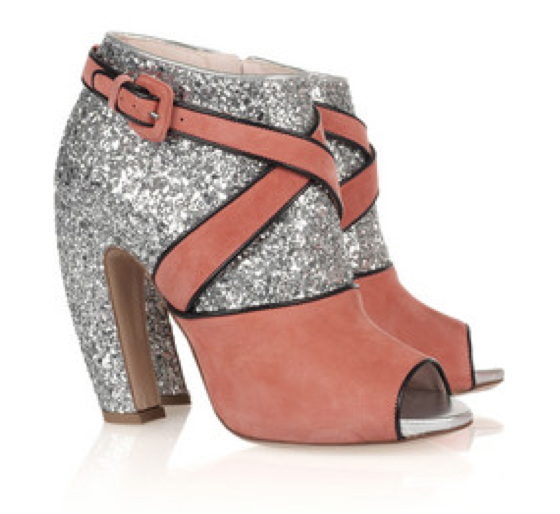 At the end of the summer I fell in love with the Miu Miu Glitter Booties (who didn't! ), and dreamed of being able to own one of each style in every color (yup, I'm that crazy), but sadly that is never going to happen when those pretty puppies are close to $900 a pop! So as the season went on from summer, to late summer, to fall, to winter, I admired all of the lovely glitter infused boots/booties showing up on Pinterest - those with glittered backs, sparkling heels, or totally doused in glitter. 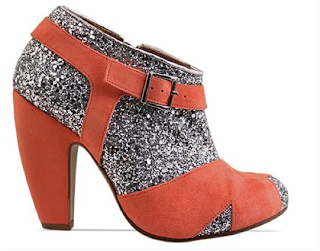 And even considered DIY-ing my own pair of glitter booties! Right! Are you as amazed as I am!? These little shimmer shoes are $700 less than their Miu Miu inspiration counter-parts, and they are a dead ringer for the designer pair! They come in three (Miu Miu colors) - honeysuckle, lemon, and black, and I love the closed-toe design. I was about to splurge on these outfit-making babies (my mouse was poised over the "Checkout" button), when I started to worry. How do I feel about a company so blatantly ripping off an original design of another (even if it is in my favor)? Miu Miu obviously designed a successful and creative shoe - the Miu Miu booties have been flying off the shelves, and are sold out in most places, despite the $900 price tag! So is it right that I should get this amazing design, copied by lower price-point designer? I am seriously torn! Have you ever bought a knock off item or obviously copied design? Sorry to leave you for the weekend on such a downer note, but I really am interested in hearing your discussion! Have a great weekend though! Wow! Those shoes looks so similar! Since I would never buy shoes for that much, I think it's okay to get "knock offs", but if they are pretty similar in price I would get the real version. Those shoes are sick! I'd go for the knockoffs or DIY glitter your own pair. definitely knock offs. the real thing just aren't in my budget! ahhhh those miu miu shoes are absolute perfection! !